The diocese was erected and constituted a suffragan of the Diocese of Goa, of which it had previously formed a part, by the Bull "Pro excellenti praeeminentia" of Paul IV, 4 February, 1557 (cf. Bullarium Patronatus Portugalliae Regum, I, 193). It was later reorganized according to the Concordat of 23 June, 1886, between Leo XIII and King Luiz of Portugal and the Constitution "Humanae Salutis Auctor" of the same pope, 1 September, 1886. It is suffragan to the patriarchal See of Goa (cf. Julio Biker, Collecçao de Tractados, XIV, 112-437). The diocese consists of two strips of territory along the sea-coast, the first about fifty miles long, by eight in its broadest part, the second thirty miles in length. There are two important towns, Cochin and Alleppi (Alapalli) in which the higher educational and charitable institutions of the diocese are situated. The Nestorian Christians in the vicinity of Cochin naturally attracted the attention of the missionaries, and Fathers Simao de Guimaraens and Luiz do Salvador were soon occupied in refuting their errors and reforming their discipline and customs (Hist. Seraf., III, 497). These two missionaries were the pioneers of the Faith among the Nestorian Christians. Members of the same order continued this missionary work till the middle of the sixteenth century, when these missions were handed over to the Jesuits, who continued the good work with such earnestness and zeal that most of the Nestorian Christians were converted before 1600. The chief public record of their conversion is to be found in the Process of the Synod of Diamper (of Udiamperur), held in June, 1599, by Alexio de Menezes, Archbishop of Goa, Metropolitan and Primate of the East ("Bull. Patron. Por. reg. ", a collection of papal and royal documents pertaining to the Portughese missions in India, App. tom. I, 147 sqq. ; see also "Subsidium ad Bull. Patr. Por. ", Alleppi, 1903). In December, 1502, the Nestorian or Syrian Christians (they used the Syrian language in their liturgy) presented to Vasco da Gama, who had arrived at Cochin, the sceptre of their former kings, and applied to him for assistance against their Mohammedan neighbours. Gama formally accepted the sceptre in the name of the King of Portugal. The Syrian bishop of those Christians promised obedience to the pope through the Franciscan missionaries and two Nestorian priests accompanied Gama to Lisbon en route for Rome. Thus began the protectorate of the Portuguese over the Syrian Christians, a protectorate which lasted for 160 years (cf. João de Barras, "Asia", Dec. I, bk. V, ch. viii; also "Historia Serafica"). Till 1542 the Franciscans were the only regular missionaries in India, though they had the cooperation of some secular priests, as Father Pedro Gonsalves, Vicar of Santa Cruz church in the city of Cochin, and father Miguel Vaz, a zealous preacher of the Faith, as well as of some isolated members of other religious communities, who had come out as chaplains to the fleets ("Commentarios do Grande Affonso d'Albuquerque", 3d ed., 1774, I, ch. v, 19-20), and "Ethiopia Oriental", II, bk. II, ch. i). Among the pioneer priests of Cochin mention should be made of the Franciscans João d'Elvas and Pedro d'Amarante, who till 1507 preached the Gospel at Vypeen, Palliport, Cranganore, and other important places; Father Manuel de S. Mathias with his eleven companions, who laboured for the conversion of the pagans at Porroead, Quilon, Trivellam, and elsewhere. Father Vincent de Lagos, who in 1540 established the college of Cranganore to train the Nestorian Christians in the purity of Catholic Faith, a college highly praised by St. Francis Xavier, and the first built in India. In 1542 it had eighty students (Amado, Hist. da Egreja em Portugal e colonias, Vol. VII, pt. II, 117-21). After St. Francis Xavier's arrival in India, 6 May, 1542, the Society of Jesus quickly spread over India, and the members were always most successful in the missions under their charge. St. Francis often visited Cochin, where the citizens gave him the church of Madre de Deus, and asked him to establish in the city a residence of the Society. It was accordingly founded by Father Balthazar Gago, S.J., in 1550. In the same year Father Nicolao Lancelot, S.J., built the residence and college of Quilon, and Affonso Cipriano, S.J., the residence of Mylapore, soon after the residence and college of Punicail were established, and the residence of Manar. In 1560 the King of Portugal built for the Society of Jesus the college of Cochin, and in 1562 a novitiate of the Society was established there. In 1601 the Jesuit Province of Malabar was founded, and Cochin was made the residence of the provincial. Among the early Jesuits must be mentioned in addition to St. Francis Xavier, foremost of missionaries, Fathers Mansilha, Criminal, B. Nunes, H. Henriques, F. Peres, F. Rodrigues; Brothers Adam Francisco, N. Nunes. Later, the Dominicans, Augustinians, and other orders followed the Society of Jesus to India. The Dominicans built their monastery and college at Cochin in 1553; some years later their example was followed by the Augustinians, and still later by the Capuchins. Cochin thus became the stronghold of the Faith, and it was the missionaries of Cochin who carried the Gospel throughout all Southern India and Ceylon, everywhere establishing missions, and building churches, charitable and educational institutions, all of which were endowed by the kings of Portugal. The above-mentioned Bull of Paul IV, by which the diocese was constituted, raised the collegiate church of the Holy Cross (Santa Cruz), the parish church of Cochin, to the dignity of cathedral of the diocese, and established therein a chapter consisting of five dignitaries and twelve canons. At the same time the pope gave the patronage of the new diocese and see to the kings of Portugal (Bull. Patr. Port. Reg., I, 194). Until 1506 Hindu law, which was rigorously observed, forbade the use of lime and stone in other constructions than temples. Hence the early Portuguese, to avoid displeasing the rajah, built their houses of wood. Finally the viceroy, Francisco de Almeida, induced the Rajah of Cochin to permit him the use of lime and stone, and on 3 May, 1506, the first stone for the fortress and city was laid by the viceroy with great pomp. It was the feast of the Finding of the Holy Cross, which thus became the patronal feast of the city, and gave to the parish church its title. The church of the Holy Cross (Santa Cruz) was begun in, or rather before, 1506, for in 1505 we find Portuguese soldiers contributing towards the construction of the church of Cochin 1000 xerafins (about $150 a large sum four hundred years ago), the result of an auction of the rich booty of a naval combat (Gaspar Correa, "Lendas da India", I, 522; II, 182). Some years later this church was raised to collegiate rank, endowed by the king, and provided with a vicar and six beneficed ecclesiastics. It was a magnificent buildings the mother church of the ancient Diocese of Cochin, which the Malabar, Coromandel and Fishery boasts, and Ceylon once obeyed and under whose teaching and discipline they flourished. 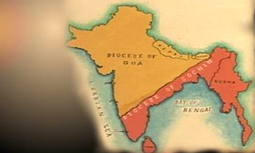 There are now not less than eleven bishoprics in the territory of the original Diocese of Cochin. The first Bishop of Cochin was Dominican, Father Jorge Tremudo, an illustrious missionary on this coast. The Brief "Pastoralis officii cura nos admonet" of Gregory XIII, 13 Dec., 1572, permitted the Bishop of Cochin, on occasion of the vacancy of the See of Goa, to take possession of that see and administer it till the Holy See provided for the vacancy. This is why many bishops of Cochin were appointed archbishops of Goa. In 1577 Brother João Gonsalves, S.J., engraved at Cochin, for the first time, the Malealam type, from which was printed the first Malealam book, "Outlines of Christian Doctrine", written in Portuguese by St. Francis Xavier for the use of children. In 1578 Fr. João de Faria, S.J., engraved at Punicail the Tamil type, with which the "Flos Sanctorum" was printed in Tamil for the Fishery Coast (Paulinus a S. Bartholomaeo, "India Orient. Christiana" Rome, 1794, 179 sqq. ; "Oriente Conquistado", Vol. I, Pt. I, Cong. I, Div. I, section 23). Due to the religio-political rivalries, the Holy See decided to hand over the major portion of the Diocese to the Vicariate of Verapoly. Thus on 24th April, 1838, the Diocese of Cochin was annexed to the Vicariate. This Papal Decree crated some rift between Portugal and Rome but was solved later. On 23rd June, 1886, the great Pope Leo XIII promulgated the famous Concordat, called "Humanae Salutis Auctor" by which the Diocese of Cochin was restored to its original status and placed again as a suffragan under the Archdiocese of Goa. Simultaneously the Vicariate of Verapoly was raised to archdiocese and the Diocese of Quilon was erected as its suffragan. The emergence of these two dioceses was from the old Padraoado Diocese of Cochin, which was erected on 4th February, 1557. Thus we can rightly say that Cochin Diocese, after Goa (1534) was the 'mother diocese' of all the bishoprics. From Cannannore in the north it stretched down to Cape Comorin and Ceylon in the south and went along the eastern coast of the peninsula all the way up north to include even Burma! The Diocese of Cochin is immensely pleased to see her progeny growing healthy and hearty though she herself has dwindled to the most diminutive in the country with only 236 sq.kms of territory! After the Diocese was released from the 'care' of her daughter, Verapoly Vicariate in 1886, it was in a miserable condition. There was no Cathedral, nor any Bishop's House. The new Bishop Dom Joan Fereira lived in a rented house just in front of the gate of the present INS Dronacharya and later on at Alappuzha. He bought the current House (1888) from a Dutch family and began the construction of the existing Santa Cruz Cathedral. The 31st and the last Portuguese Bishop was Dom Jose Vieira Alvernaz (1942-1951). On 19th June 1952, by the Decree "Ea Redemptoris Verba" of Pope Pius XII, the new Diocese of Alleppy was erected dismembering Cochin again and the administration of the Diocese was brought into the hands of the indigenous clergy. The first native bishop of Cochin was Dr. Alexander Edezhath (1952-1975) who was succeeded by Dr. Joseph Kureethara (1975-1999) on 22nd December 1975. The late Bishop Joseph Kureethara was very keen on developing the Diocese at the socio-religious sphere. His Excellency established many institutions including a college, schools, hospitals and charitable homes, erected parishes and churches and established a new religious congregation for women called the 'Sisters of Holy Eucharist'. After a prolonged illness Bishop Joseph Kureethara was called to his heavenly reward on 5th January 1999. Rev. Dr. Josy Kandanattuthara, the then Chancellor, subsequently became the Apostolic Administrator of the Diocese. The Very Rev. Father served the fold and herded the flock diligently with his inborn qualities of humility and concern and care for all till the Diocese was blessed with the appointment of a new bishop by the Pontiff, Pope John Paul II, on 25th June 2000. The Bishop, Rt. Rev. Dr. John Thattumkal, formerly a secular priest of the Diocese, is a member of the Congregation of the Fathers of St. Joseph Benedict Cottolengo. His Excellency had served the Diocese in different capacities like Judicial Vicar, Procurator, Pro - Chancellor prior to his joining the Religious Order. A brilliant scholar, he has taken his doctorate in Canon and Civil Laws from the Pontifical Urban University, Rome. His thesis on the social structure of the Catholic Church in India entitled " Caste and the Catholic Church in India" published by the Urban University had stirred a hornets nest way back in the 1980's. His Excellency's "UT UNUM SINT OMNIA OMNIBUS FACTUS SUM" is indicative of his outlook and attitude towards life,especially, spiritual. Within this short span of his reign the new prelate has put his own imprint on the history of the Diocese. Liked, loved and respected by the people in general and the faithful in particular, Rt. Rev. Dr. John Thattumkal has become quite notable among the Catholic Bishops and noteworthy among the intelligentsia. But he was suspended after some issues on faith and practices on 24 Oct 2008. The present and 35th Bishop Dr Joseph Kariyil was formerly Vicar General in the Diocese of Cochin (2000 – 2005). He also held the posts of The Editor of Talent ( 1987-1992 ), Director of P. O. C (1992-2000), Bishop of Punalur (2005-2009).